Don't wait any longer ! 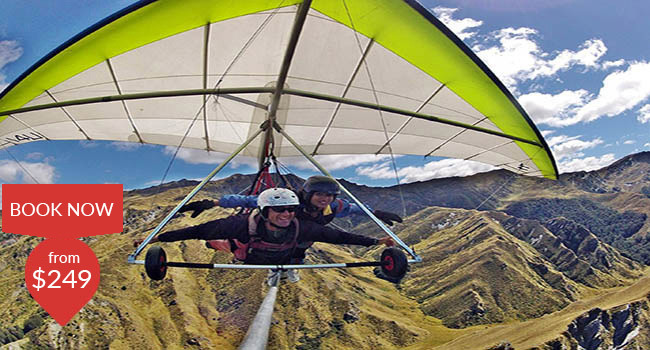 Skytrek is where tandem hang gliding all began in New Zealand. The company pioneered the adventure sport here ! 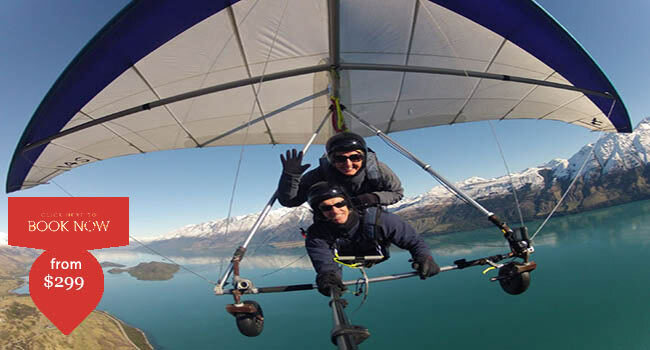 Tandem Hang gliding or Paragliding is one of the best adventure activities you can experience while visiting Queenstown. We fly year round bringing you the most incredible flights as the seasons change in one of the most scenic places in the world. New Zealand’s highest commercial launch site from the top of Coronet Peak. Departs every hour and a half from 9 a.m. until 7:30 p.m. from 26b Shotover Street. 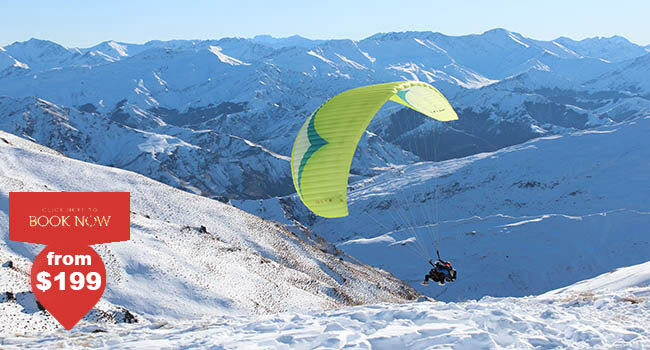 Fly from the top of Coronet Peak Ski field. Flight time is up to 20 minutes. Departs 9 a.m., 11 a.m., 1 p.m. and 2:45 p.m. or meet on the ski field. Flight time up to 20 minutes depending on conditions. Departs every hour and a half from 9 a.m until 7.30 pm from 26b Shotover Street. Departs 7.45 a.m., 9.45 a.m., 12.30 p.m., and 2.30 p.m.
We provide flights from Coronet Peak located just 20 minutes’ drive from the centre of town. Let the Skytrek courtesy shuttle pick you up from town and drive you to one of our launch areas ranging from 3800 feet to 5500 feet high. The highest commercial take-off in New Zealand. 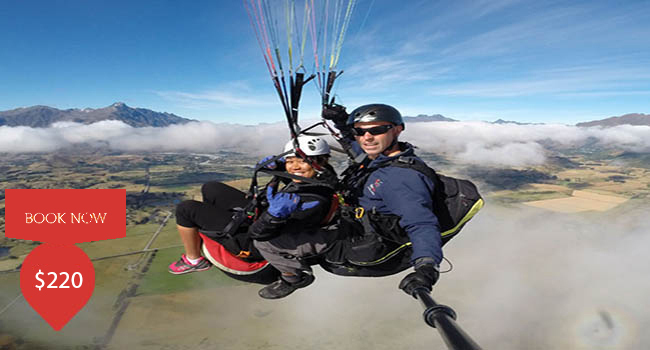 Your pilot will gently guide you through the steps required to become airborne with us so you can enjoy the breath taking views from Coronet Peak across the Queenstown Surrounds. Our friendly and professional team of tandem pilots are highly experienced and will ensure your experience will be one to remember! Skytrek is weather dependant, we fly most days but to avoid disappointment, we recommend you book early during your stay in Queenstown rather than leaving it to your last day. If the flight is cancelled by Skytrek due to weather conditions the flight can be transferred to another date or a full refund can be given. There is no refund given on cancelations under 24 hours of departure if the customer cancels the flight. If you are late for departure and miss check-in there will be no refund given. What to bring : Warm clothing and suitable footwear are recommended. Gloves and Jackets are also provided on request. Transport : We supply a courtesy van which departs from Skytrek Shop, 26b Shotover Street, Queenstown. Allow one and a half hours for either the tandem Paragliding or Hang Gliding Flight. Spectators : If you're accompanying a fare-paying passenger, come along for the ride and enjoy the panorama (on a space-available basis). Photos : Photos and Videos are available using a GoPro that captures you, your pilot and the amazing scenery around you. They are available to purchase on landing. Waiver : You will be required to commplete a waiver and medical condition disclosure form. Age and Weight limitations : Maximum limit of 120kg for Paragliding, 100kg for Hang gliding. Skytrek has flown passengers aged 4 to 90. Passengers aged 16 or under require parents' or guardians' permission. We are company number 6268152 registered in New Zealand. Our registered office is at 47 Woodstock Road, Lower Shotover, Queenstown. We are extremely concerned to protect your privacy and confidentiality. We understand that all users of our web site are quite rightly concerned to know that their data will not be used for any purpose unintended by them and will not accidentally fall into the hands of a third party. Our policy is both specific and strict. It complies with New Zealand law and with the laws of all jurisdictions of which we are aware. If you think our policy falls short of your expectations or that we are failing to abide by our policy, do please tell us. 2.4 to tell you about other of our services or services of sister web sites. This information is never taken by us either through our website or otherwise. At the point of payment, you are transferred to a secure page on the website of DPS Payment Express. That page may be dressed in our “livery”, but it is not controlled by us. Our staff and contractors never have access to it. 10.4 to operate the online notification form - the form that you use to contact us for any reason. This cookie is set on your arrival at our web site and deleted when you close your browser. 10.7 to store your personal information so that you do not have to provide it afresh when you visit the site next time. This cookie will last for  days. 10.8 to enable you to watch videos we have placed on YouTube. YouTube will not store personally identifiable cookie information when you use YouTube’s privacy-enhanced mode. If you wish us to remove personally identifiable information from our web site, you may contact us at www.45southtandems.co.nz To better safeguard your information, we will also take reasonable steps to verify your identity before granting access or making corrections to your information. Our web sites are hosted in New Zealand We also use outsourced services in countries outside New Zealand from time to time in other aspects of our business. Accordingly data obtained within New Zealand may be “processed” outside New Zealand and data obtained in any other country may be processed within or outside that country. Ready to start your experience with us but want more information ? Give us a Phone call, email us or come in and see us.